Preheat oven to 350°F. Working with one chicken cutlet at a time, seal chicken cutlet between two pieces of plastic wrap and gently pound the cutlet until it’s an even thickness (about 1/4-inch). 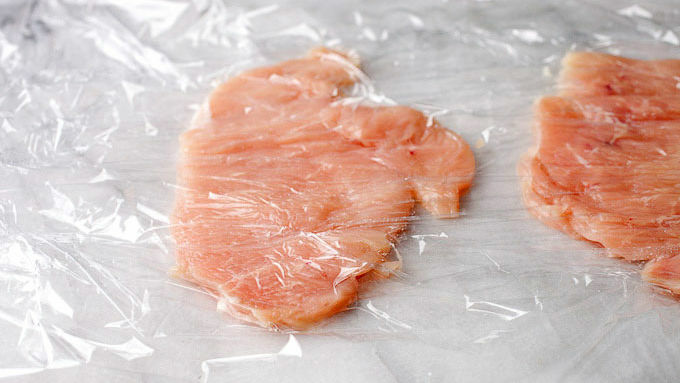 Take the top layer of plastic wrap off and add a slice of ham and grated cheese to the chicken cutlet. Tuck the ends in a bit and roll the chicken cutlet up to form a tight cylinder. 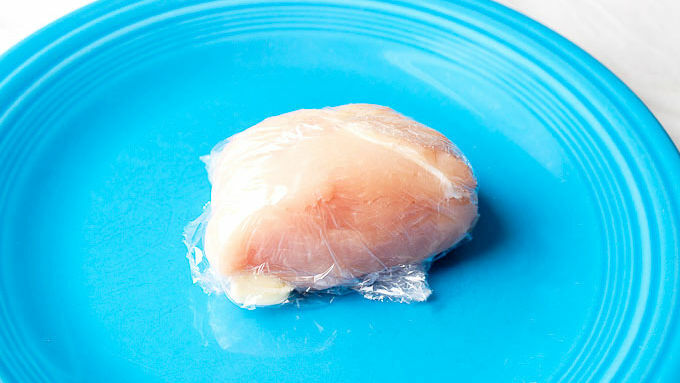 Wrap chicken in bottom plastic wrap piece and press it tightly together. Repeat with other three cutlets. 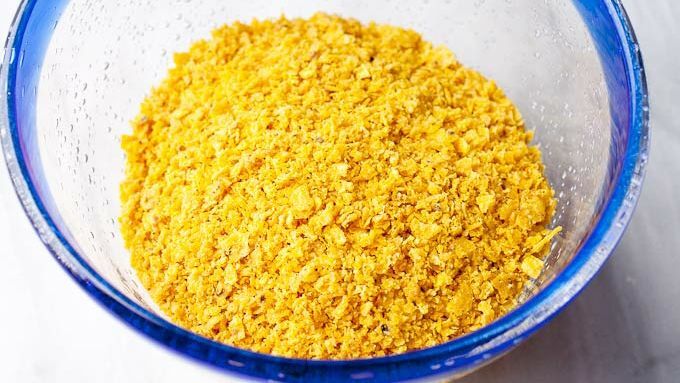 Prepare breading ingredients by mixing together flour, salt, and pepper, whisking eggs, and crushing Cool Ranch™ chips. Unwrap chicken pieces and dredge in flour, followed by egg, and lastly the Cool Ranch™ crumbles. 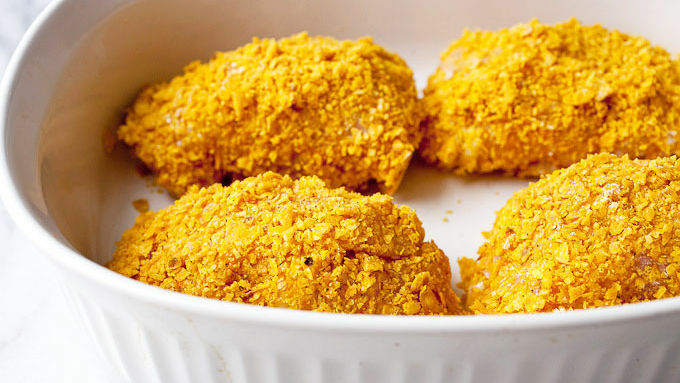 Pack them on tight so the entire chicken piece is coated. 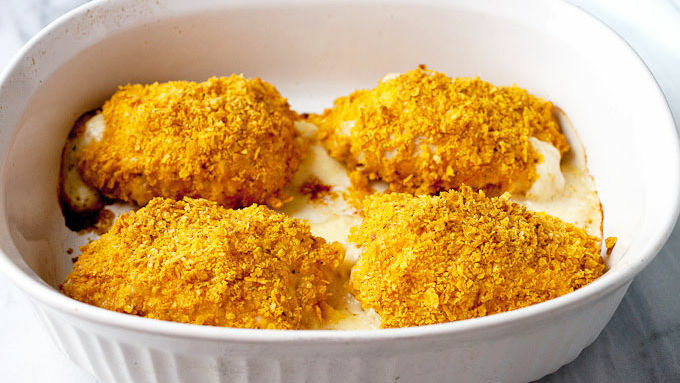 Place finished chicken cordon bleu in a baking dish. Repeat with other pieces. 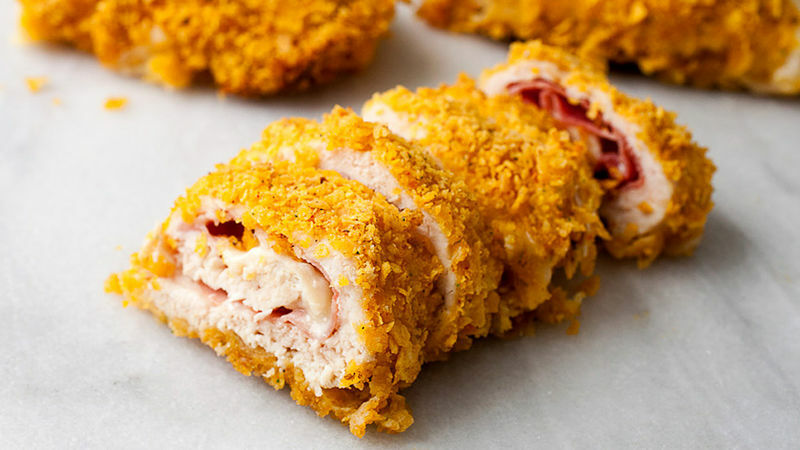 Bake chicken cordon bleu for 30 minutes. A meat thermometer should read 165°F in the thickest part of the chicken. Let cordon bleu chicken cool for a few minutes and slice into rounds with a serrated knife. Serve immediately! You can make the cordon bleu in advance, up to the breading step. Keep the stuffed chicken wrapped in plastic until you are ready to bread and bake. The classic French Cordon Bleu with a Cool Ranch™ Doritos™ twist! Ahhh…chicken cordon bleu! That classic French dish that people seem to think is only worth ordering at restaurants. In reality, though, it’s totally doable at home. Once you get the hang of it, it doesn’t take long and you can coat the stuffed chicken in anything you want. For this version, I got a little wild by coating the cheese-stuffed chicken cutlets with crushed Cool Ranch™ Doritos™. (That’s right.) You’d be surprised how well these flavors go together! The best way to slice these so they stay together is with a good serrated knife. Good luck, and get your cordon bleu on!